or scroll down the page to all holiday houses with disabled access. Bedrooms: 3 (2 kingsized, 1 twin). Sleeps: 6 + travel cot. Isle of Mull. Pets welcome. Disabled access and wheelchair friendly. 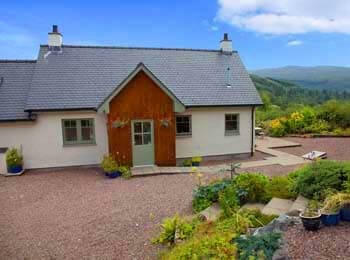 Seilisdeir is a lovely, spacious house right on the edge of a loch, with stunning views towards the hills beyond. This is the perfect location for relaxing and taking in the ever-changing scenery. There's a huge variety of wildlife and birdlife in the area, as well as being a great base for visiting the local castles, exploring the island, visiting Staffa, Iona and Tobermory or just taking it easy by the open fire. Mull is an idlyllic place for a Scottish holiday! 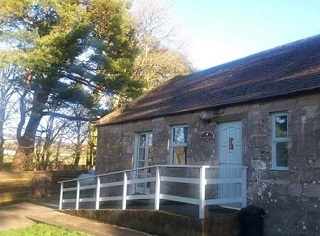 Kinblethmont Coach House and Stables is situated in the heart of the estate, surrounded by mature woodland and set amidst the rolling Angus countryside. It is a great place to celebrate a special event or have a relaxing holiday and the huge open plan living area, with 10m glass frontage looking onto the woodlands, make it a special place to stay at any time of year. The owners have used very high quality materials for this stunning conversion - from the solid oak staircase to the polished granite work surfaces in the kitchen. Kinblethmont is very well placed to take advantage of all that Scotland and Angus has to offer - beaches, golf courses, castles, hill walking, visitor attractions, distilleries and much more. Bedrooms - 2 (double/twins). Sleeps 4. Sanquhar. Pets welcome. Suitable for disabled visitors. This pet friendly cottage has a riverside location (perfect if you come to fish!) and is surrounded by beautiful countryside. It is however still within striking distance of Edinburgh and Glasgow. Nearby is amazing walking (it's on the Southern Upland Way), cycling, golf, castles and with an award-winning restaurant next door it's a great place for a self-catering holiday! Bedrooms: 2 (1 double, 1 twin/super-kingsized, 2 additional single beds available). Sleeps: 4 + 2. Fort William 23 miles. Well behaved dogs welcome. Short breaks. Wheelchair accessible. 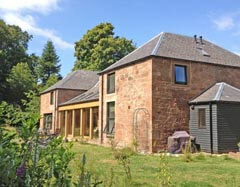 Rose Cottage is situated on a working croft and offers very high standard self-catering accommodation. The giant hot tub is a marvellous place to relax with spectacular views of mountains across the Strontian glen. The Ardnamurchan peninsular is a wonderful holiday destination with remote sandy beaches, lochs to fish and hills to roam - paradise! Bedrooms: 3 (1 family, 1 double, 1 bunk room). Sleeps: 8 or 6+2. Oban 12 miles. Pets welcome. Short breaks. Cat 2 for disabled. Sithean is a stunning new house on a working organic hill farm. Sithean means 'fairy knoll' in Gaelic and is built in an elevated position overlooking Glen Lonan. It commands spectacular views of Loch Etive and the �Shepherds of Glencoe� to the north, and Ben Cruachan to the east, and the distant hills of Ardnamurchan to the west. The wildlife, walking and cycling around Sithean is fantastic, and afterwards you can relax in the sauna enjoying the comforts, peacefulness and panoramic views. Bedrooms: 4. Sleeps: 8+. Fort William 25 miles. Wheelchair accessible. Pets welcome. Short breaks welcome. 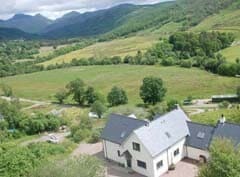 This is a fabulous self-catering house in Ardnamurchan in the West Highlands of Scotland and has 5 stars from Visit Scotland and their gold award for Green Tourism. It has been beautifully equipped and the hot tub is a great place to relax and admire the views or watch the stars! 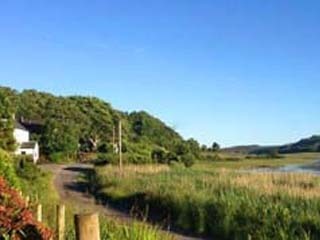 The area is perfect for walking, cycling, fishing and kayaking and is a wildlife enthusiasts' paradise. There is produce from the working croft and children can help feed the sheep and hens. For large holiday groups there is an adjoining 2 bed cottage to rent so the accommodation can sleep 12 + children. Blashie Cottage is situated on a private estate and is surrounded by beautiful scenery and historic buildings. The Ochil Hills are to the north and the Central Belt to the south. Fishing, shooting, hillwalking, golf and tennis are all available on the estate. The town of Dollar with good shopping is 2 miles away and there are several restaurants within 5 miles. 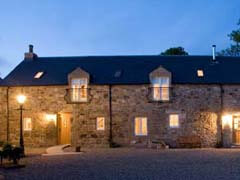 The cottage is warm, recently refurbished and is rated as 4 star by Visit Scotland. You will have wonderful holiday here! Bedrooms 2. Sleeps: 4. Pets welcome. 5 star luxury cottages. Disabled access. Three 5 star cottages in luxury conversions of historic farm buildings, boasting original features and an extremely high standard of comfort. 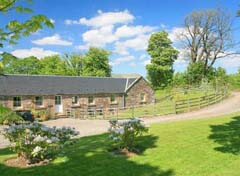 Beautiful views of surrounding countryside, and many activities nearby (golf courses, New Lanark, walking etc). On-site putting green, mountain bikes, laundry service, sauna, and gourmet chef by arrangement. Situated between Edinburgh and Glasgow, this is an idyllic place to stay to explore Scotland if you want a luxurious break. or scroll up the page to see holiday houses with disabled access. Holiday cottages with disabled access. 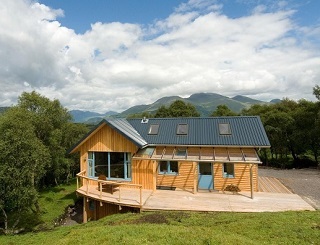 A selection of cottages suitable for people requiring disabled access throughout Scotland. Find suitable and available holiday cottages, with the specific disabled facilities that you require, many luxury holiday cottages suitable for people with limited mobility or and for those who require disabled access.